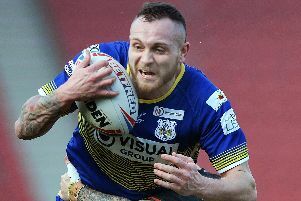 Doncaster’s pre-season plans were thrown into turmoil last night after promoted Hunslet Hawks punished a woeful display to claim a 42-12 win at the Keepmoat Stadium. Several key players were missing, and others – including player-coach Paul Cooke - were having their first run-out but the Dons fielded a squad from which the bulk of the team to face London Broncos on February 15 will be chosen so there can be no excuses. It was a performance totally out of character with last season’s highly-successful campaign and questions will need to be asked before Sunday’s final pre-season game against a Leeds Rhinos XV. Although no-one at the club had expected an easy game against their fellow Championship rivals, who look to have recruited well, no-one expected such a resounding defeat either. “We certainly didn’t see it coming,” said Cooke reflecting on the club’s biggest defeat of their warm-up campaign. With half-backs Danny Ansell and Andy Kain pulling the strings, Hawks looked better organised, quicker in possession and stronger in the forwards. Hunslet raced into an early 12-0 lead with a brace of tries by prop Michael Haley. Chances were few and far between for Dons in the first half – although centre Lee Waterman, who hurt his ankle in the process and missed most of the rest of the game, almost got over wide out after he ran strongly for the line. Hawks bombed a try on the half-hour but they made no such mistake the next time they broke in numbers. Doncaster forward Mike Kelly made a rare clean break only to spoil any chance of a try when throwing out a wayward pass 20 metres out. Hawks swooped again six minutes after the restart. The Dons finally opened their account after 64 minutes with a close-range try by second-rower Jack Walton, converted by Stu Sanderson. Dave Scott touched down for a late converted trybut Hunslet had the last word with a seventh converted try.